What is the transit time between Busan Port and Los Angeles Port? South Korea is one of the key success stories of export led growth economies. South Korea's exports have reached to 559 billion USD in 2013 from 253 billion USD in 2004, which makes the South Korea 8th biggest exporting country in the world. South Korea and US are close trading partners and international trade between these two nations has been increasing as well. US is the 2nd biggest export market for the South Korean companies, while US is the 3rd importing partner country for South Korea market. 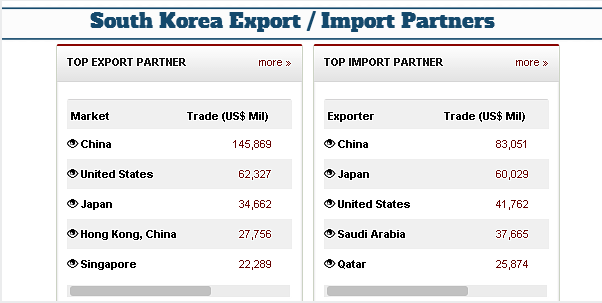 USA was the second-largest market for South Korean exports in year 2013, worth $62.3 billion. Also South Korea is a signifiant import market for the US exporters, whom exported 41 billion USD value goods and services in the same year. When you evaluate these foreign trade figures, you can realize that sea transportation between these two nations would be very big in numbers as overwhelming amount of the cargo transportation handled via sea freight between USA and South Korea. The Los Angeles Customs district consists of the Port of Los Angeles, the Port of Long Beach and Los Angeles International Airport. Los Angeles port is the leading part of the formation. 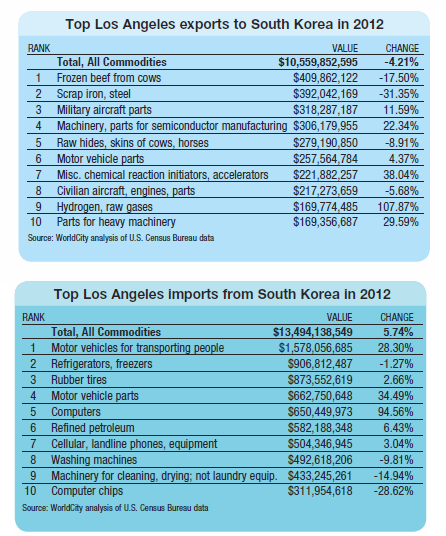 South Korea is the 3rd top trade partner of Los Angeles custom district as of year 2012. In year 2012, Los Angeles custom district created 24Billion USD value international trade with South Korea. How long does it take for a container vessel to come from Busan Port, South Korea to Los Angeles Port, USA? Today I would like to explain the transit time between Busan Port, South Korea and Los Angeles Port, USA. 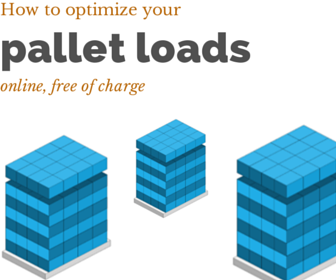 I will be giving three different examples of shipment schedules from well-known container lines, which are working between these two important ports. First of all, let us have a look at the general features of the ports in question. 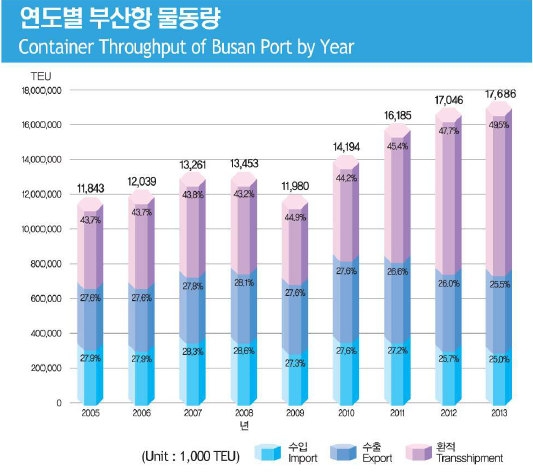 Busan Port established its firm status as the world’s 5th largest container port by handling 17.6million TEU in 2013. The high competitiveness of Busan Port has been proven by the continuous growth of major shipping companies’ calls and the transshipment cargo volume. Recently, the world’s largest shipping company Maersk Line added Busan Port to their schedule of the Asia-Europe (AE10 service) route which includes the vessel Tripple-E.
Transshipment cargo in Busan Port increased from 36.5% in 2001 to 49% in 2012. The Port of Los Angeles, the premier gateway for international commerce, is located in San Pedro Bay, 20 miles south of downtown Los Angeles. It features 24 passenger and cargo terminals, including automobile, breakbulk, container, dry and liquid bulk, and warehouse facilities that handle billions of dollars’ worth of cargo each year. Now let me try to show you the transit time between Los Angeles Port and Busan Port via different container liners as belows. What is the transit time between Busan Port and Los Angeles Port via China Shipping? China Shipping follows direct Busan Port and Los Angeles Port route with its own container container vessels. The transit time is around 11 days. 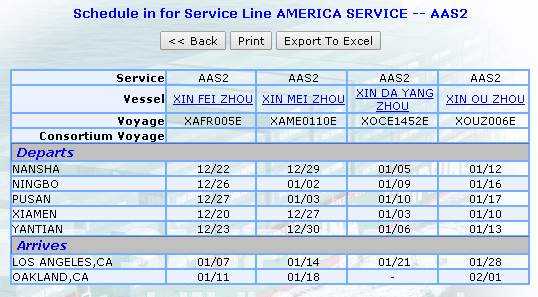 You can search China Shipping's Busan Port to Los Angeles Port current vessel schedules from this link. 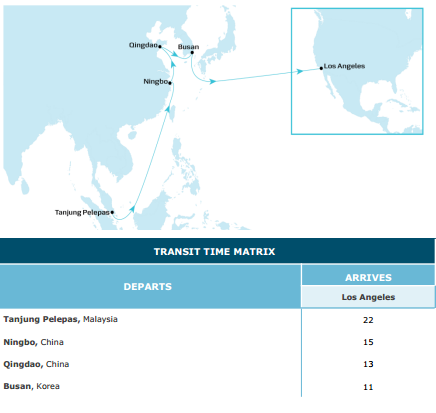 What is the transit time between Busan Port and Los Angeles Port via Maersk? Maersk follows direct Busan Port and Los Angeles Port route with its own container container vessels. The transit time is around 11 days. This is an express service. You can search Maersk's Busan Port to Los Angeles Port current vessel schedules from this link. What is the transit time between Busan Port and Long Beach Port via Hanjin Shipping? Los Angeles Port and Long Beach Port are two ports, which are located side-by-side in San Pedro Bay. The only difference between these ports is that they are operated by two separate entities. Hanjin Shipping follows direct Busan Port and Long Beach Port route with its own container container vessels. The transit time is around 12 days. You can search HANJIN's Busan Port to Long Beach Port current vessel schedules from this link.